Cost/benefit analysis is an estimation and evaluation of net benefits associated with alternatives for achieving defined goals of the business and is the primary method used to justify expenditures. It’s also a critical piece of the business case. If the opportunity is outside the expertise of readers, you should include more details to allow them to become comfortable with your recommendation. Companies are looking for a positive return on their investment, and most organizations have minimal financial measurements for the opportunity to achieve before it can be considered cost justified. Therefore, additional details can help companies predict financial impact even when the recommendation isn’t easily measurable. Where most analysts stumble in writing a business case is in knowing how much analysis is enough but not too much. (You don’t have to fully analyze each recommended option to the point of absolute certainty.) A business case is a vehicle to gain approval to move forward, which means more analysis occurs after approval but before the project is actually developed or software is purchased. Committing the resources to fully analyze a solution before approval doesn’t make sense. However, not doing enough analysis can result in approval for significantly less funding than is ultimately necessary. Through experience, you’ll become better at aligning the appropriate analysis effort and the amount of the funding request with the final estimates for the actual results. Goodwill: An accounting term describing an intangible benefit received by an organization when its customers and investors have a positive feeling or impression of it. Although goodwill isn’t included in the net cost/benefit calculation, you should include it in the description as supporting text to justify or support why an alternative wasn’t selected. You may also refer to it in the risk section. Sunk costs: An accounting phrase describing expenditures that are in the past and shouldn’t have any bearing on future decisions. An opportunity may be a continuation of another project, but any sunk costs associated with the prior project shouldn’t be included in the calculation for the current business case. Cash flow: The availability of assets at any given time in an organization. The cost of developing a project and the resulting ongoing or operating cost should be offset by the positive revenue or cost savings over time. The cash flow analysis shows the initial cash required to develop and implement and the expected returns over time. Payback period: The length of time required to recover the cost of making the change or developing a new product. Most organizations have a minimum requirement for a project to be paid back in order to be approved based on the amount funded. Return on investment (ROI): A financial performance measure used to evaluate the efficiency of a number of different investments. ROI is calculated by dividing the profit or savings of an investment by the cost of the investment over time. If multiple alternatives are being considered, each alternative must be analyzed and documented using the same approach. This step is extremely important for options where a financial comparison is being shown. 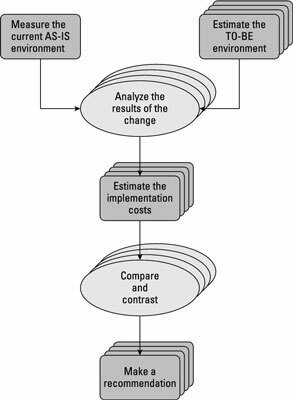 Determining the costs and benefits means estimating two main categories — one-time cost of change and net impact to ongoing operations. The source of cost that is usually most obvious is the one-time cost of change. The less-obvious (but equally important) cost is the difference between the cost of the current business process and the cost of the recommendation after it’s in place at some future time: the net impact to ongoing operations. These two categories make up the overall cost/benefit of the proposal, which may reflect a positive or negative cost/savings after calculated. The current process is considered your as-is process, and the future recommendation is your to-be scenario. For a brand new initiative, you have only a to-be cost or savings. These costs are composed of the ongoing or operating costs of the new recommendation plus the costs to get it built, implemented, and working in place. Initiatives can impact people, processes, or systems and should be analyzed individually to ensure that all aspects have been included. After you’ve identified and quantified all costs and benefits for each impact group, the total of these items makes up your current and future ongoing/operating costs/benefit cost or savings. The difference between these items is your cost justification or comparison for each option.